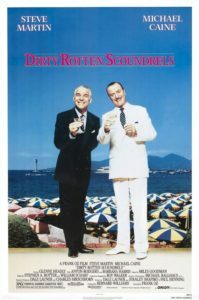 015 – Dirty Rotten Scoundrels | All Eighties Movies. All The Time! This week we’re off to the French Riviera for a little sun, holidaying and hijinks as Michael Caine and Steve Martin try and best each other in the hilarious comedy Dirty Rotten Scoundrels! This entry was posted in Podcasts and tagged comedy, dirty rotten scoundrels. Bookmark the permalink. One of my favourite movies of all time. Thanks Ozzies. You did it credit. We HONESTLY did not not know we were releasing this pod cast on the same day back in 1988 this film was released!!! Total freak out! Hope you all enjoy it. Make sure to comment if you liked it! Oh go on! OMG how funny. I’m a huge Steve Martin fan too. Loved your podcast. I’ve listened to your previous eighties podcasts but first time I’ve made a comment as I love this so much. Thank you Angry and Gidget. You are both so natural and obviously love these movies. I was born in 1973 and grew up with these movies as well. Also love you are Aussies. Real novelty. I’ll tell the guys at my work about you. First time I heard Airplane! was called Flying High! News to me. Keep up the good work. – Joseph – Syracuse, NY. THANK YOU for reminding me of this classic comedy film. I had not seen it for years but I will be watching it again this weekend. Oh the memories came flooding back as to how funny it really was. Thank you both for a fantastic funny entertaining podcast and for reminding me how great this movie was. Consider me a new fan. Now going to listen to your other podcasts. Thanks for cool pod cast on this movie. Forgot about it until now. Love you two! So much fun. I saw this movie at the cinema with my father. We both laughed so much we went back to see it a second time. Thanks for recapping it. My father has passed now but this film reminds me of a wonderful time when he and I saw it and seeing him laugh. Thank you. Thank you Brett for your lovely comment. I’m glad our podcast could remind you of the time with your late father. I feel the same about my late father and Star Wars. He took myself and my brother to see it when it was released. He loved it so much he took us to see it a second time. Very funny pod cast. Big laughs. Great movie. Love it. Thanks. I cannot love this movie more! Congratulations both of you Angry and Gidgit. You handle comedy films with such respect and joy. Catching up on ones I have missed.